Despite cloudy skies and a little bit of rain, Wednesday felt more like summer, especially compared to the last week or so. 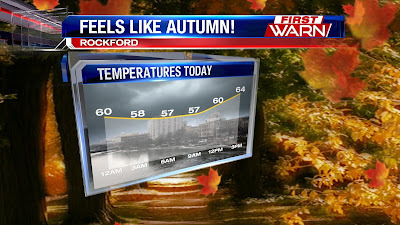 Wednesday marked the first time Rockford hit 80° in almost a week. 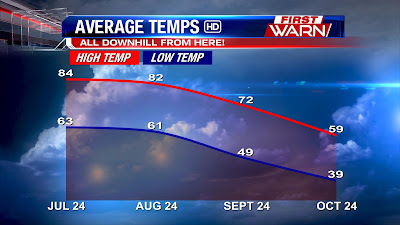 Things really bottomed out on Saturday, when highs only topped out in the mid 60s. Temperatures over the past week have ranged anywhere between 10° to 20° below average and if you're hoping for any significant warm up it doesn't look like it will happen any time soon. So, what's the cause for the cooler weather? A fairly persistent low pressure system in Canada has cause a buckle in the jet stream pattern. The jet stream is the driving force, or 'interstate', for storm systems and is also responsible for bringing down cooler air from the north and warmer air from the south. 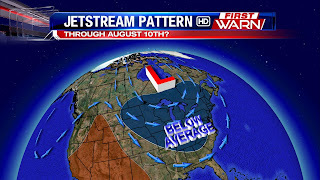 A long wave trough, or dip in the jet stream, has been stuck in place across the Great Lakes and East Coast while a ridge of high pressure has been present in the West and Southwest and up into Alaska. In fact, Fairbanks and Anchorage Alaska have had one of their warmest spells on record for the summer months. When the weather pattern remains persistent it's hard to break and usually takes some sort of shift in the overall atmospheric pattern for change to occur. This change will eventually happen but likely not within the first two weeks in August. The two week outlook from the Climate Prediction Center indicates temperatures will remain below average across the middle section of the country. 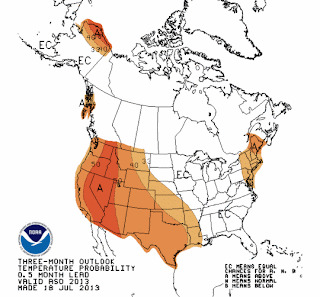 After that, there are some signs that point to a gradual warming trend towards the middle of August. Even though we've had some gloomy days the 70s and low humidity really haven't been all that bad. Enjoy them now because I'm sure the 90 degree heat and humidity will return. 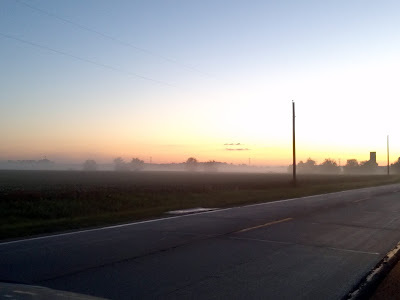 The USDA released the latest Illinois Weather & Crop report Monday afternoon. 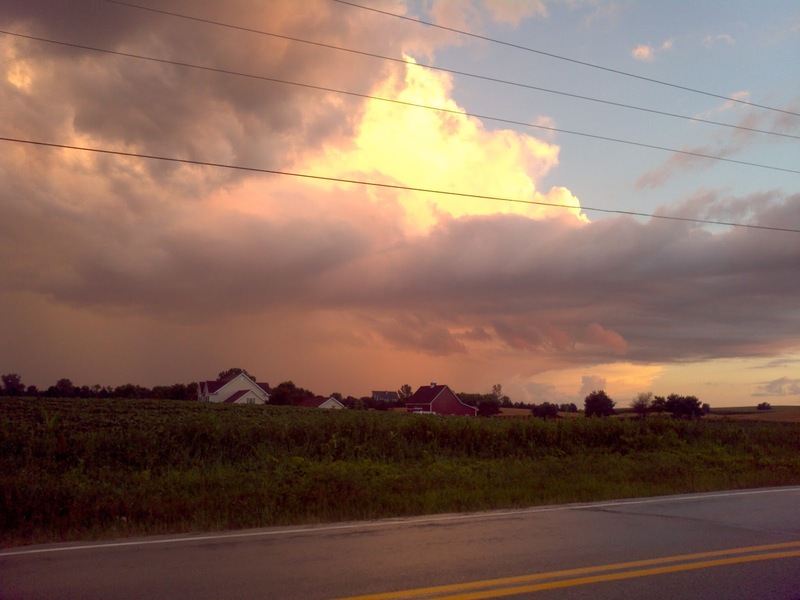 The recent rain across the state and cooler temperatures have continued to benefit the corn and soybeans. There are a few isolated spots in Central Illinois that could use a little more rain while southeastern parts of Illinois have received too much. Rainfall this morning across the central part of the state should help those in need of rain. Low pressure in northwest Missouri will move east/northeast through the morning and afternoon into central Illinois. 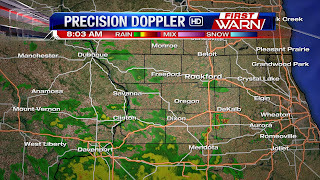 Light to moderate rain is falling in eastern Iowa and west-central Illinois and will continue to expand north into the Stateline throughout the day. 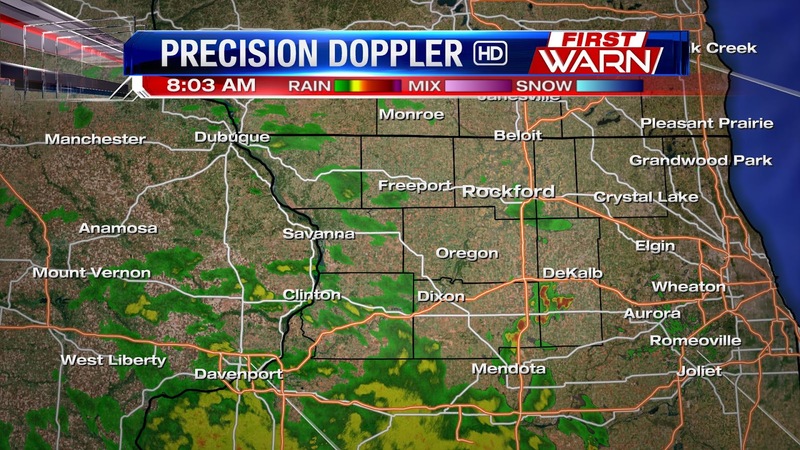 Heaviest of the rain will remain closer to the low, but look for scattered showers throughout the day. Temperatures will remain in the 60s & 70s under the cloudy and rainy skies. 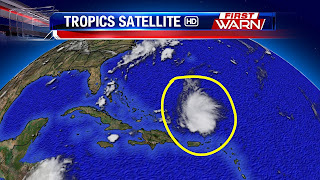 Scattered showers and thunderstorms are all that's left of what used to Tropical Storm Dorian. These storms remain a few hundred mile north of Puerto Rico and Virgin Islands of as late Monday morning. The disturbance doesn't appear to have much low level circulation associated with it and the environment it's moving into is only slightly favorable for redevelopment of tropical conditions. The National Hurricane Center is giving this low roughly a 40% (less than half) chance of becoming a tropical cyclone within the next 48 hours. 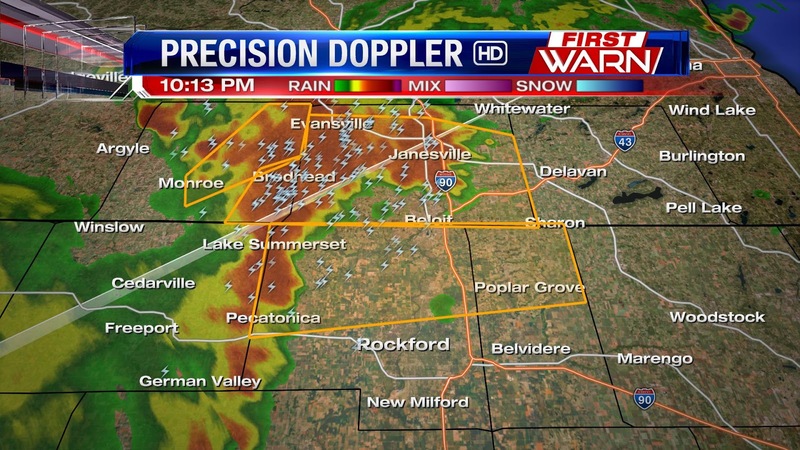 Current movement of the system is to the west and northwest at 15 mph. If the decision is made that further investigation into the low is needed there is an Air Force Reserve Unit Reconnaissance aircraft scheduled for later this afternoon if needed. Meanwhile, further west Tropical Storm Flossie continues to move west and is expected to impact the Hawaiian Islands later today and tonight. 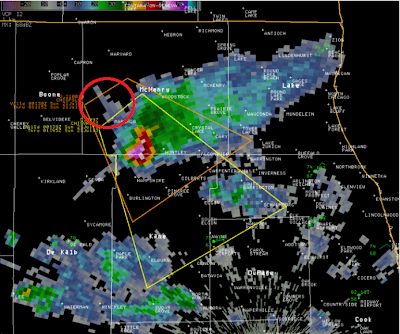 As of 11am CDT the storm has taken a slight shift northwest and is moving west/northwest around 16 mph. The storm is moving into an environment not favorable for further storm development, however, Tropical Storm Warnings have been issued for the Hawaiian Islands. Strong winds, heavy rain and high surf can all be expected. 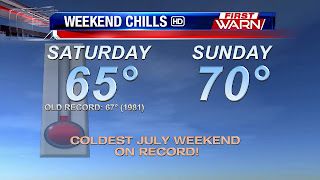 While many may have enjoyed the fall-like weather we experienced this weekend, it was a record cold July weekend! 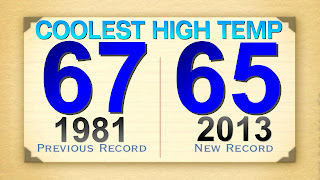 Not only did we break the record for the coolest high temperature on Saturday we also broke the record for the coldest July weekend ever in Rockford. A very strong low pressure system over the Great Lakes brought down cool air from northern Canada while temperatures surged into the upper 70s/low 80s in the interior of Alaska! Talk about a temperature swing! Even though we didn't break any records on Sunday, those northerly winds resulted in the coldest July weekend on record in Rockford with an average temperature for Saturday and Sunday of 60.5°. 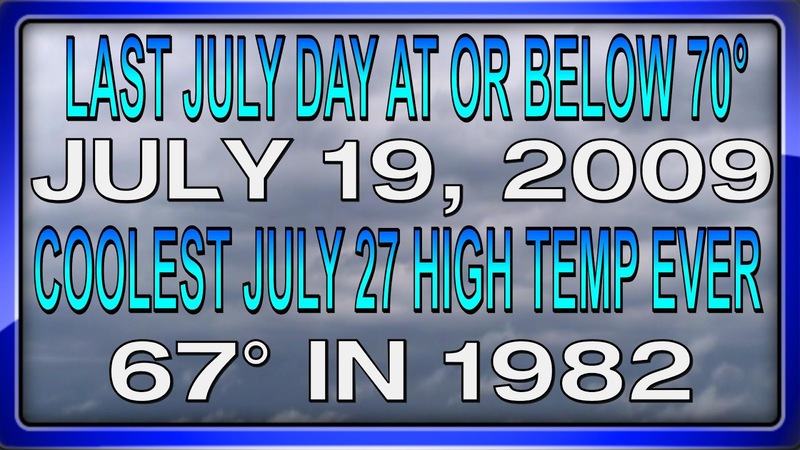 The previous coldest July weekend was back on July 12th & 13th, 1975. Looking out over the next two weeks of August yield no major signs of any warm ups coming soon. This is called a "fire rainbow". These are actually pretty rare even though the physics behind the formation is relatively simple. First, they only form via ice-based clouds which are very high up in the atmosphere. That's why the clouds in front of the shiny colors are not also glowing--because they are only made up of rain droplets in the mid levels of the atmosphere. When the sun shines on the ice crystal a certain way, it actually diffracts the color rather than refracts. 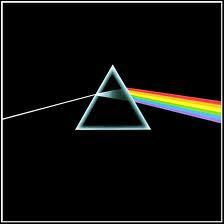 You know Pink Floyd's Dark Side of the Moon album cover? 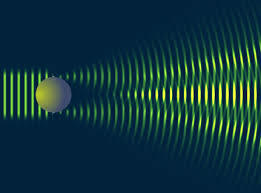 Well, that light is refracting and shows all the colors in the visible spectrum in a linear manner after the light passes through it (like a rainbow). With ice crystals, however, the light diffracts and actually scatters. This is because the light passes through a perfectly symmetrical item, like an ice crystal, rather than an asymmetrical prism (like a water droplet) in which light refracts into a rainbow. 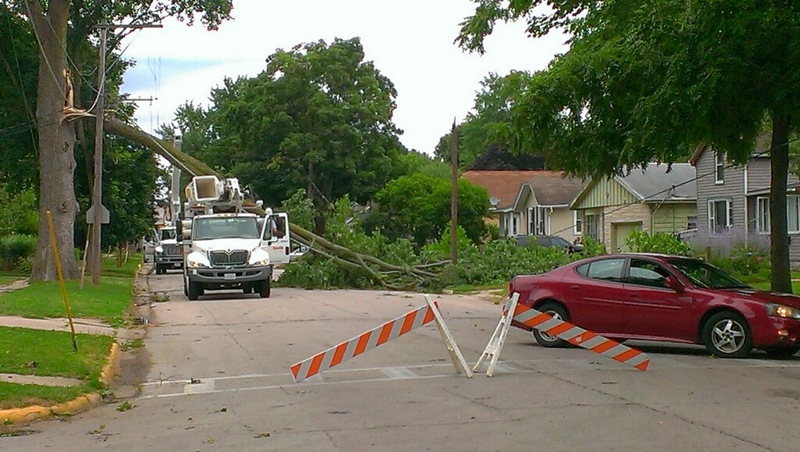 Saturday's fall-like temps caused a weather record to be shattered. Temps throughout most of the day stayed plateaued in the upper 50s to low 60s. 67° was the coolest daily high temp on any-given July 27th back in 1981. 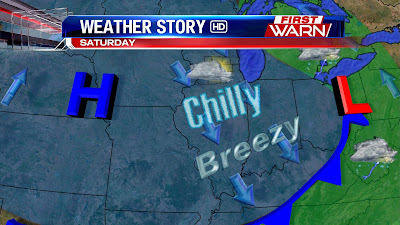 But, due to ample clouds and a stiff breeze from the north, we only reached 65° on Saturday. This sets a new record for the lowest max temperature at Rockford Airport. A fall-like weekend is setting up--very uncommon for lat July! 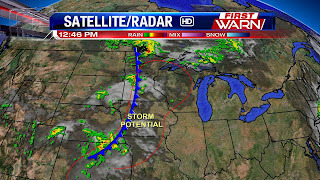 A cold front passed through the Stateline Friday evening with the center of the low pressure system relatively close by. 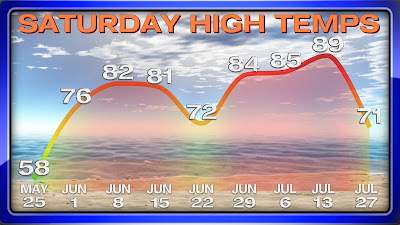 Usually when cold fronts pass through our area in the summer-time, skies are clear the next day and the sun can heat up the earth and allow temps to rebound a little bit. But, because the main low pressure system is passing relatively close to the Stateline in the Midwest, there will be wrap around moisture on the back end of the system causing for dense clouds to build in Saturday. Couple this with a growing high pressure feature over the Central Plains, and winds are going to flow in from Canada bringing in cooler air. Because of this, temps will barely skim 70° in the afternoon. In fact, most of Saturday will be spent in the mid 60s. The showers from earlier this morning continue to move east of I-39 with skies beginning to clear near the Mississippi River. Within the clearing temperatures have reached the low to middle 70s while we're stuck in the middle 60s. As we head through the afternoon I anticipate temperatures to rise a little as clouds begin to break up across northern Illinois and southern Wisconsin. 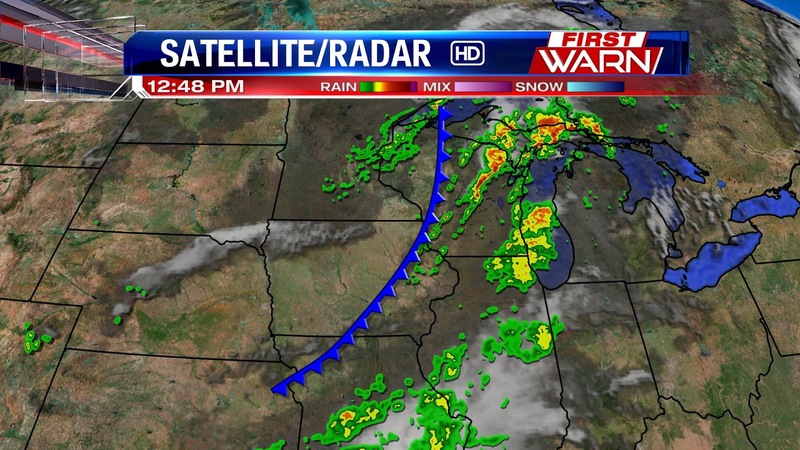 The strong cold front currently extends from northern Wisconsin southwest to just west of Dubuque, IA. 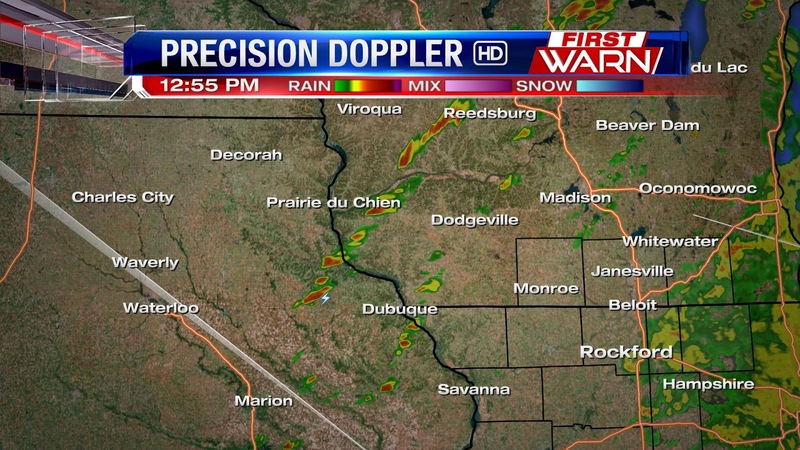 There have been a few scattered showers and embedded thunderstorms that have developed west and southwest of Madison where skies have cleared allowing instability to rise slightly. This will be the area for favored storm development for the next couple of hours as an upper level low moves through southern Minnesota and northern Iowa into Wisconsin. Instability and low level lapse rates (change in temperature with height) will continue to increase as the front and strong low pressure system move through Wisconsin. 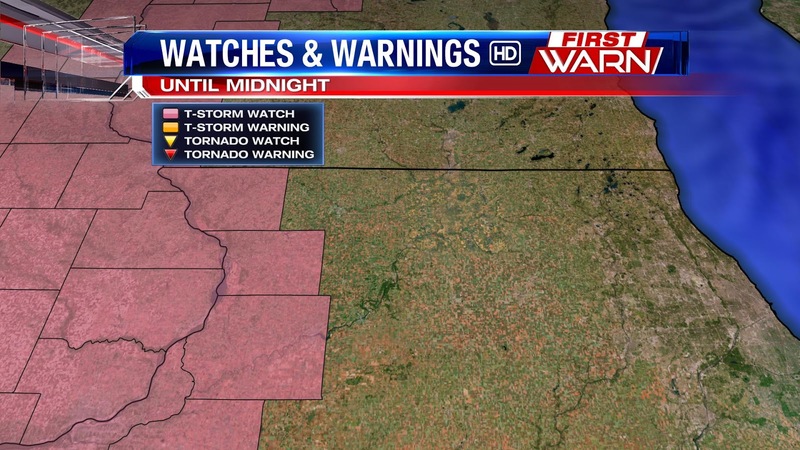 Additional thunderstorms will likely develop across central Wisconsin and possibly eastern Iowa/far northwest Illinois through the afternoon. 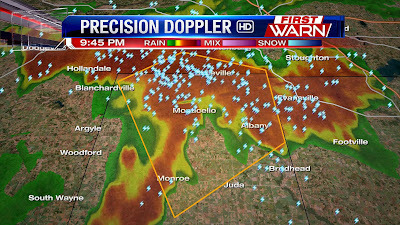 The greatest likelihood of strong storms appears to be north of the state line from Monroe to Janesville and points northward. 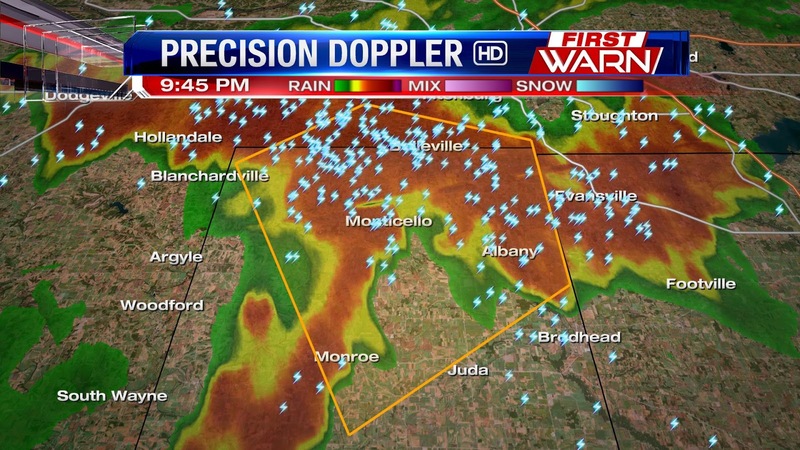 There, storms may produce large hail and strong wind gusts. Here is the WSI RPM model for 3pm this afternoon. 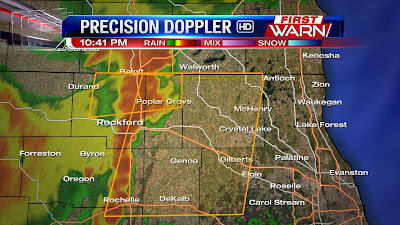 You how the storms line up along the front extending from Green Bay, WI to Platteville, WI to Mt. 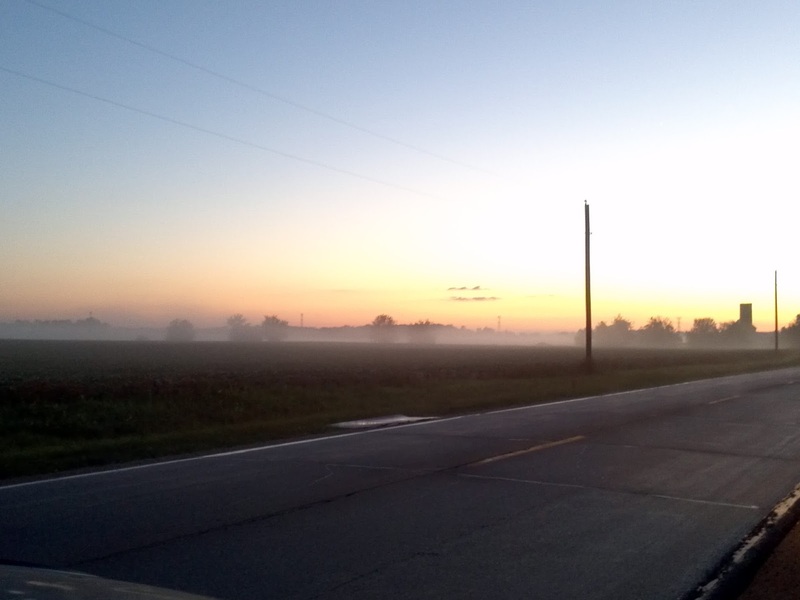 Carroll, IL. Instability across the immediate Stateline (northern Illinois) may be limited due to the current cloud cover. However, I still expect a few thunderstorms to move across the area through 7pm before ending with the passage of the cold front. Coolest Weekend in 2 Months! 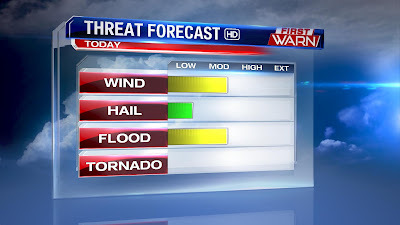 Some of these cells, especially by the afternoon, could bubble up into strong thunderstorms with plenty of lightning, gusty winds and heavy downpours being the main threats. The next cold front will signal some pretty big changes with the weather for the weekend but will also bring scattered showers and thunderstorms to the Stateline tonight and Friday. The front extends from northern Minnesota southwest into the central Plains and has been the focus for scattered storm development early this afternoon. Thunderstorms will likely continue to develop in the area outlined in red from northern Wisconsin to just west of Dubuque, IA later this today with skies remaining fairly quiet across N. Illinois and S. Wisconsin. As storms increase in coverage to the west they may creep into our northern and northwestern counties (line extending from Monroe to Freeport) this evening with a greater potential for storm development overnight. Scattered thunderstorms will continue through Friday with the cold front before ending Friday evening. Temperatures will remain below average through the weekend. 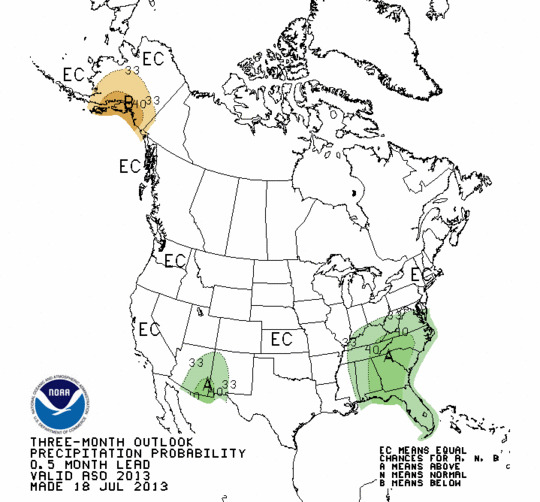 The Climate Prediction Center just issued their 3 month outlook, and it looks like the Stateline is in for semi-normal conditions! Overall, average precipitation amounts are forecasted through October. 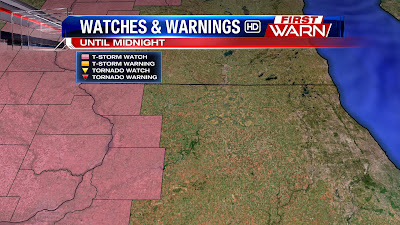 If this forecast verifies, Stateline crops should be bountiful. Also, average temps are expected. Anomalously warm conditions are expected for the Western United States, but that is not a surprise considering that they've had a very hot summer thus far. 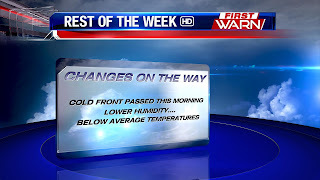 Much cooler conditions on the back end of the cold front that passed late Monday night. 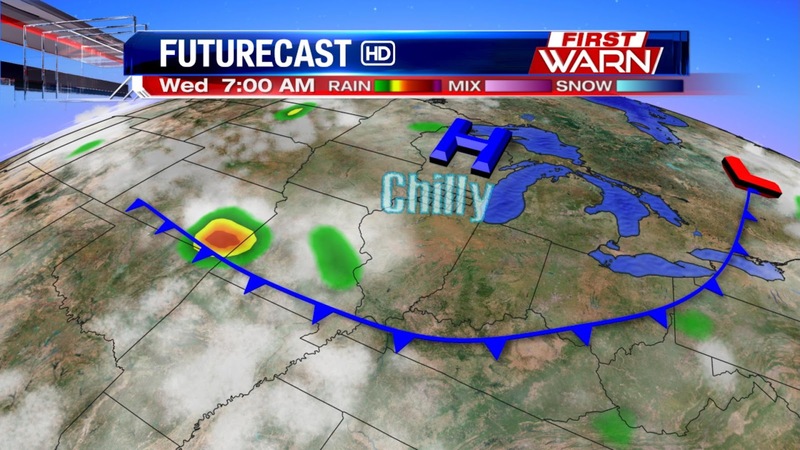 High pressure advances down from Canada ushering in cooler temps. By sunrise, high pressure is directly over the Stateline. 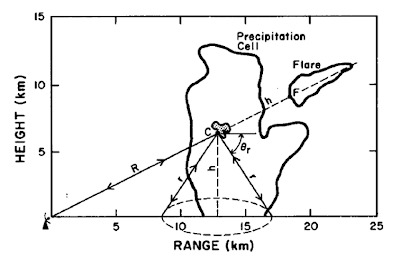 This allows for "radiational cooling" to occur. This happens when high pressure is overhead getting rid of all cloud cover. 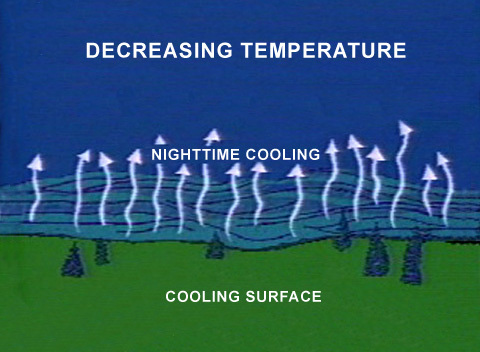 At night, clouds act like a blanket that keep in the heat, but when skies are clear (like tonight), all the heat we got during the day escapes into the atmosphere and in its place is cool air. 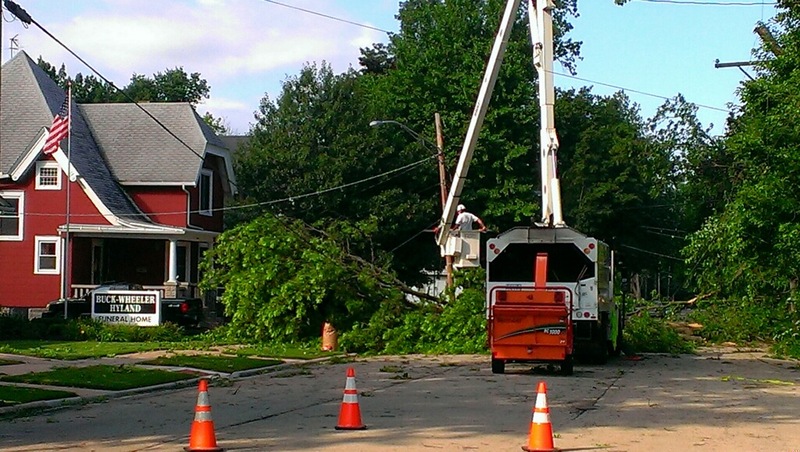 Strong to severe storms developed along and ahead of a cold front Monday evening and produced significant wind damage across parts of N. IL and S. WI with numerous reports of downed trees and power lines. 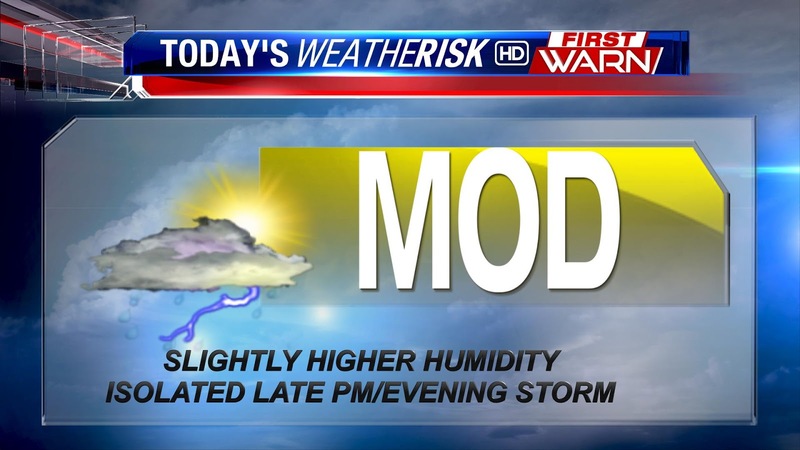 Today the weather will be a little less severe and a lot more comfortable. The strong front came through early this morning with gusty northwest following. Temperatures will rise into the upper 70s to low 80s for both today and Wednesday with overnight lows dropping into the low to middle 50s. Another strong cold front will move through Friday evening with even stronger high pressure following behind for the weekend. Temperatures will remain right at or below average through the beginning of next week. 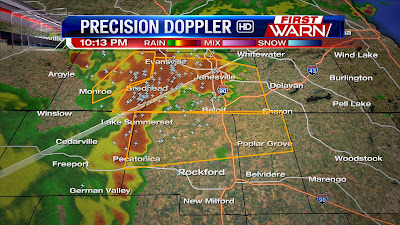 10:42pm: Severe thunderstorm warning for Boone, N. DeKalb, E. Ogle, SE Winnebago, and McHenry Co. til 11:30pm. 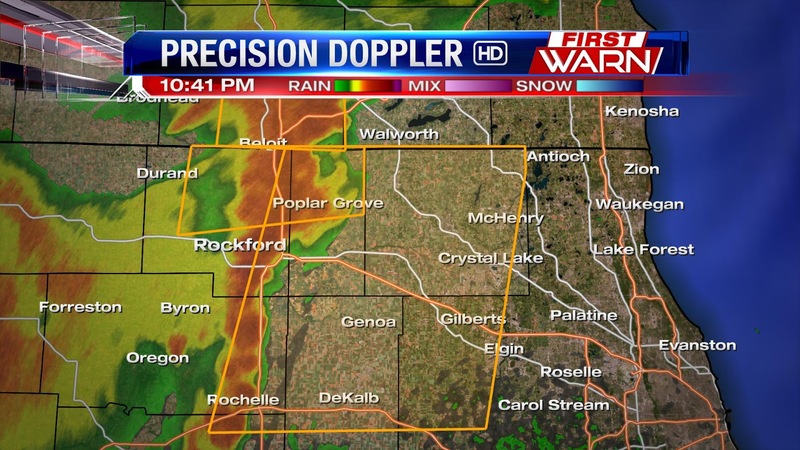 Winds greater than 70mph and quarter-sized hail are the main threats. Plus heavy rains and plenty of lightning. 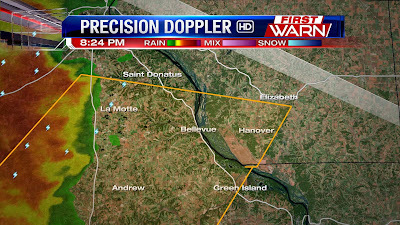 8:13pm: Severe Thunderstorm Warning in effect for Southwestern Jo Daviess County until 9:00pm./ High wind gusts are the main threat. Hanover will be impacted. 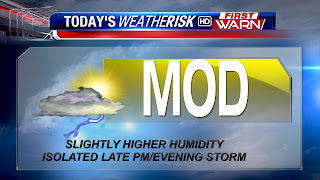 Skies will remain partly cloudy this afternoon as the temperature rises and the humidity begins to creep up as well. A fairly strong cold front (for the middle of July) currently extends from Duluth, MN through St. Cloud, MN to Sioux City, IA and to just north of Lincoln, NE. This front will move closer to southern Wisconsin and northern Illinois during the afternoon and evening. Surface heating will continue to take place ahead of the front allowing temperatures to rise into the middle and upper 80s and dew points to rise into the middle 60s. It appears as if the greatest threat for storms will remain closely tied to the cold front from a line extending along and west of Wausau, WI - Dubuque, IA, and Kirksville, MO. 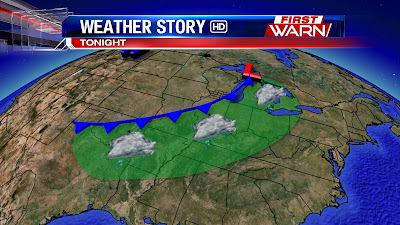 The front is expected to move through after sunset tonight and by that time the atmosphere will have lost some of the energy that had been built up during the afternoon. 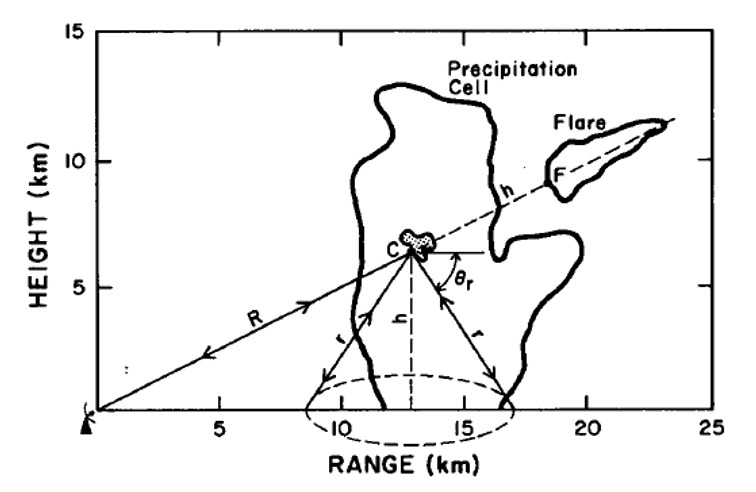 Also, the greatest lift within the atmosphere will remain further north in Wisconsin. Either way, scattered thunderstorms will remain likely through the late evening and overnight - with only a few isolated storms possible ahead of the front during the peak heating of the day...between 2pm and 4pm. 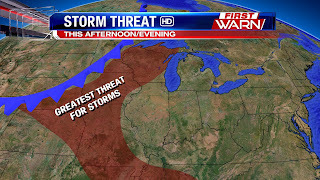 It's possible if storms fire up during the late afternoon some could contain gusty winds and hail. Our WeatheRisk for today will remain at a yellow, or moderate, due to the threat for storms later this afternoon and evening. 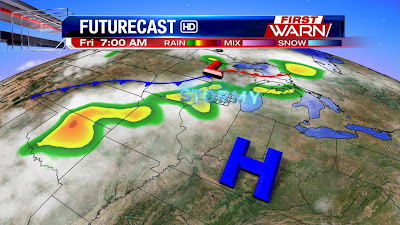 Once the front passes high pressure will move in for the rest of the week keeping the majority of storms to the south and west until the weekend. A construction trailer in Hampshire was overturned by a high wind gust injuring one person around 8pm Saturday night. That person was transported to the hospital. 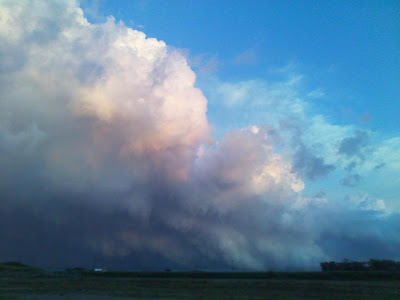 Ominous clouds tonight caused folks to think tornadoes were forming around the Stateline. 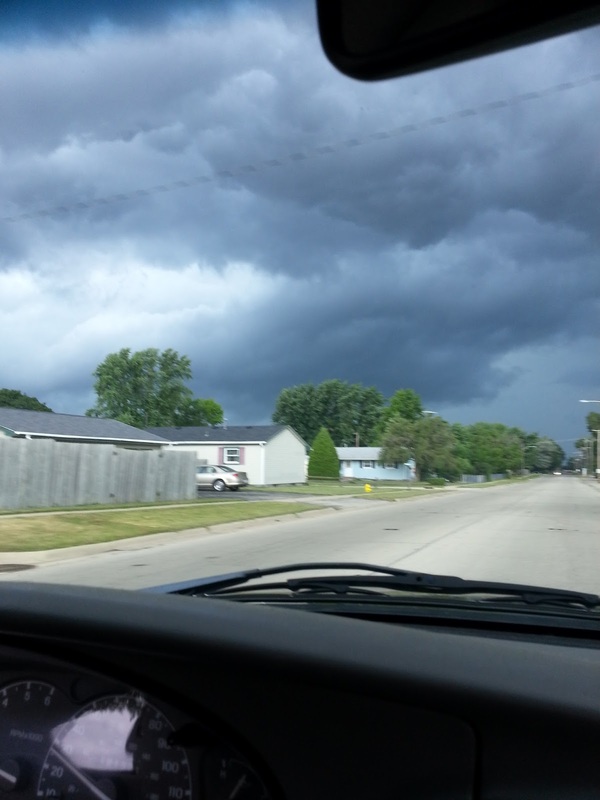 Andy captured a couple photos of these so-called tornadoes over Winnebago. In fact they were NOT tornadoes, but rather "cold air funnels." 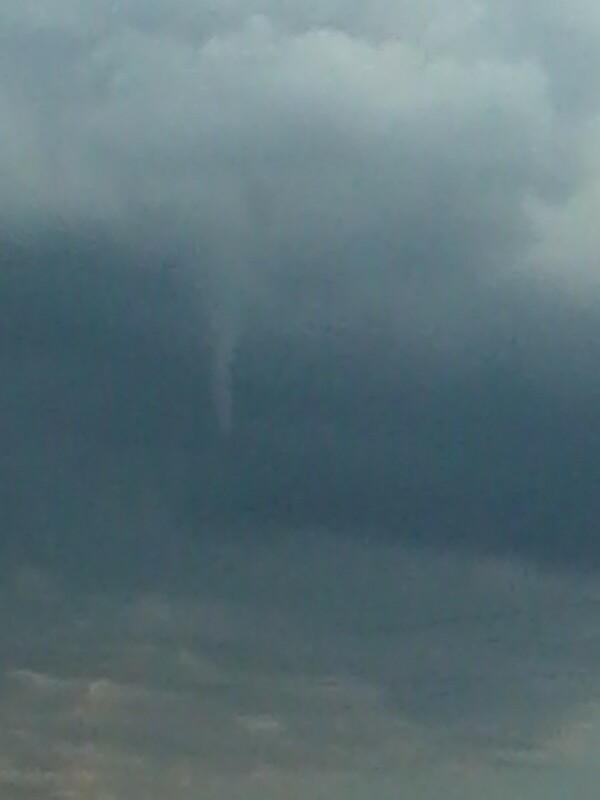 These funnels occur on the back end of a cold front in a cooler air mass--like we had today. Temps were only in the upper 80s Saturday, compared to the mid 90s we saw on Friday. Winds at the surface come from a different direction than winds in the mid-levels of the atmosphere. Saturday afternoon, a lake breeze advanced from Lake Michigan while upper atmospheric winds blew from the north. This caused weak rotation and narrow funnels to form. 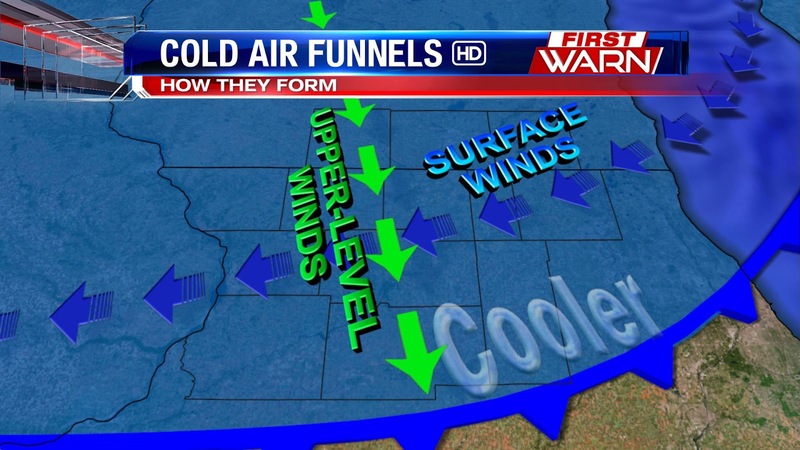 The funnels are very high in the atmosphere because the air is relatively stable and dry. 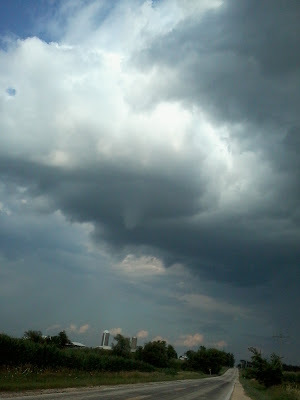 But, we were just moist enough to have condensation occur and funnels to be visible. Too Hot For Even The Roads!